6/29 Cup of Coffee: Hours after landing a spot in the MLB Future's Game with teammate Yoan Moncada, Andrew Benintendi (pictured, left) turned in a huge game. Despite his efforts, Portland fell in a devastating walk-off loss. The walk-off magic worked in the other direction for Salem, as the Sox used last-minute heroics to sweep a doubleheader. Lowell got back to its winning ways, while a familiar phenom again shut down the PawSox. When the PawSox faced Twins top pitching prospect Jose Berrios in April, they were held to two hits in seven innings. The righty's development appears to be progressing, as the PawSox managed only one hit in their second encounter on Tuesday night. Jantzen Witte spoiled the no-hit bid with a one-out double in the seventh inning. After an off-day on Monday, Brock Holt returned to the lineup as he continues to work his way back from a concussion. Holt played the full game at shortstop and was 0 for 3 with a walk. Justin Haley was the unfortunate soul who matched up against Berrios. He took the loss, allowing three runs on six hits in five innings while striking out three and walking three. Robby Scott struck out three and allowed a hit in his two shutout innings, and Noe Ramirez followed with a scoreless ninth. It was a day of highs and lows for Portland. Before the game it was announced that Andrew Benintendi and Yoan Moncada would represent the organization in the Future's Game during the 2016 All-Star festivities in San Diego. Then, in a back-and-forth contest with Trenton, Portland surrendered a four-run ninth-inning lead, as Trenton's five-run rally was capped by a game-winning inside-the-park home run. Before the ninth-inning meltdown, the story of the game had been Benintendi. The 2015 first-round pick had a monstrous evening, going 4 for 5 with two doubles, two runs scored, a stolen base, and an RBI. The outburst raised his June slash line to .316/.370/.520. Moncada didn't have as huge a day as his partner-in-crime, but he did single and steal a base. The theft was his first since his promotion to Portland last week; while with Salem, he swiped 36 in 44 tries across 61 games. Rainel Rosario joined Benintendi with a four-hit game, and drove in four runs on the night. Jake Romanski went 3 for 5 with a double, two runs scored, and an RBI. Following a strong Double-A debut last week, Jalen Beeks turned in an uneven encore, allowing only two runs in five innings. He also surrendered seven hits and walked two while striking out a pair. Taylor Grover had a strong outing in relief, striking out three against one walk in 2 1/3 innings. It was a tough outing for Austin Maddox. After not being scored on in his previous six outings, Maddox allowed four runs in only 2/3 of an inning, giving up three hits including a three-run, game-tying home run. Williams Jerez came on in relief, but Tyler Wade (NYY) delivered a fly ball to center field that was over the head of Sean Coyle. By the time the ball had reached the wall and been retrieved, Wade raced around the bases for the walk-off victory. A quintet of doubles helped Salem prevail in the opener of Tuesday's twin-bill. Nick Longhi led the way, going 2 for 3 while driving in a pair with his 16th double of the season. Jordan Procyshen broke out of a 3-for-28 skid with a double and a walk. Joseph Monge didn't join in the doubles parade, but he did blast a solo home run in the third. It was Monge's first homer since a late-May promotion from Greenville. Starter Matt Kemp allowed three runs on eight hits in 4 2/3 innings, striking out four and walking two. Mario Alcantara tossed 2 1/3 hitless innings to get credit for the win. The 23-year-old righty is 7-0 out of the Salem bullpen. Salem had a wild walkoff to come away with the sweep. Down, 6-4, in the bottom of the seventh, Bryan Hudson drew a one-out walk. Danny Mars then hit what could have been a game-ending double play grounder back to the pitcher, but the ball was thrown into center field. A Wendell Rijo single scored Hudson, with Mars and Rijo advancing to second and third on the throw home. Another error allowed Mike Meyers to reach, scoring Mars to even the game at 6-6, and Rafael Devers capped the comeback by ripping a game-winning base hit to center field. Devers had previously notched his 10th double of the year as part of a two-hit night. Rijo also doubled, ending an 0-for-10 streak since he was sent down from Double-A Portland. Anyelo Leclerc got the start in his Salem debut after an All-Star break promotion. Exclusively a reliever with Greenville, Leclerc struggled on Tuesday, allowing four runs on five hits in his three innings of work. Yankory Pimentel followed with a solid outing, giving up two runs on four hits in four innings, striking out five against one walk. Heavy rain forced a postponement of Greenville's contest in Charleston. The two will make up the game as part of a doubleheader on August 6. After a two-game blip, the Spinners got back to their winning ways. Josh Pennington turned in a strong start, scattering a pair of hits across 4 1/3 shutout innings. He struck out five, walked two, and threw 52 of his 79 pitches for strikes. Despite the Tigers tagging him with a pair of runs, Dioscar Romero got credit for the win. Romero has been the winning pitcher in relief in three of the Spinners' 12 games. Gerson Bautista picked up his fourth save in as many appearances, throwing two scoreless innings while striking out two and walking one. Nick Lovullo led Lowell's 11-hit attack, going 2 for 4 with a walk, triple, RBI, and run scored. Yoan Aybar doubled as part of his two-hit night, while Ryan Scott scored a pair of runs. A balanced offensive attack carried the Sox to victory, with each member of the starting lineup reaching base and eight different players scoring a run. The only player who did not record a hit was Nicholas Hamilton, who walked and scored twice out of the leadoff spot. Raiwinson Lameda tripled and scored, and Andrew Noviello notched an RBI double. Junior Espinoza had an auspicious 2016 debut, allowing a run on five hits in five innings while walking one and striking out five. Ryan Oduber, a lefty out of Aruba who was promoted from the Dominican Summer League after starting the year with 15 1/3 scoreless innings, made his stateside debut. Oduber allowed a hit in two scoreless frames, striking out three without walking a batter. Jordan Weems continued his conversion from catcher to the mound, allowing two runs in his inning of work. A trio of Sox hurlers combined on a seven-hit shutout. Starter Juan Perez got the win, allowing three hits and striking out three in his five innings of work. Geraldo Perez allowed a pair of hits in two innings, striking out one. Eduard Bazardo picked up the save with a scoreless ninth. None of the pitchers walked a batter in the win. Willis Figueroa and Ramfis Berroa had two hits apiece, with each notching a double. The DSL Sox2 saw their game suspended due to rain with one out in the top of the second inning. The game will resume on Wednesday. 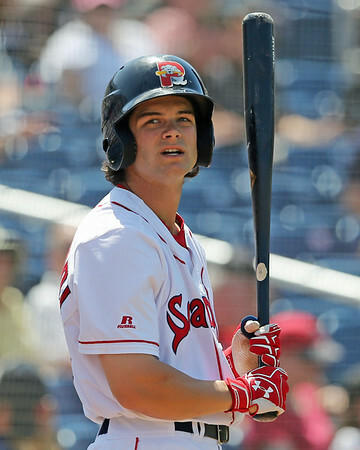 Player of the Day: Almost exactly a year after signing his first professional contract after being taken with the seventh pick in the draft, Andrew Benintendi has more than justified that selection. Benintendi recorded his second four-hit game of the season and first since his promotion to Double-A. In 71 games across two levels, he is hitting .311/.373/.500 with 25 doubles, 52 runs scored, and 55 RBI.